The quality of water in large parts of the country has clearly improved over the last few years, but the improvement is stagnating. This is why the Water Quality Knowledge Impulse has been launched today. In this research programme the national government, provinces, Water Authorities, water utilities, and the knowledge institutes Deltares, KWR, WUR and RIVM, will work on gaining more insight into the quality of ground- and surface water and into factors that impact this quality – such as nutrients, plant protection products, pharmaceutical residues and other yet unknown chemical substances. Although the launch is now a fact, there is still a need to broaden the funding to ensure that the entire programme can be realised according to plan. This will be worked on in the coming period. In early 2016, PBL Netherlands Environmental Assessment Agency, in its report ‘Water quality now and in the future’ (in Dutch), estimated that the planned improvement measures would very probably not achieve the desired water quality targets in 2027. This is the last deadline by which EU member states must have taken all the measures needed to meet the objectives of the Water Framework Directive (WFD). These objectives comprise both the composition of water flora and fauna, and the concentrations of chemicals. The PBL report also indicated that the objectives could still be met if a smart combination of measures is taken. 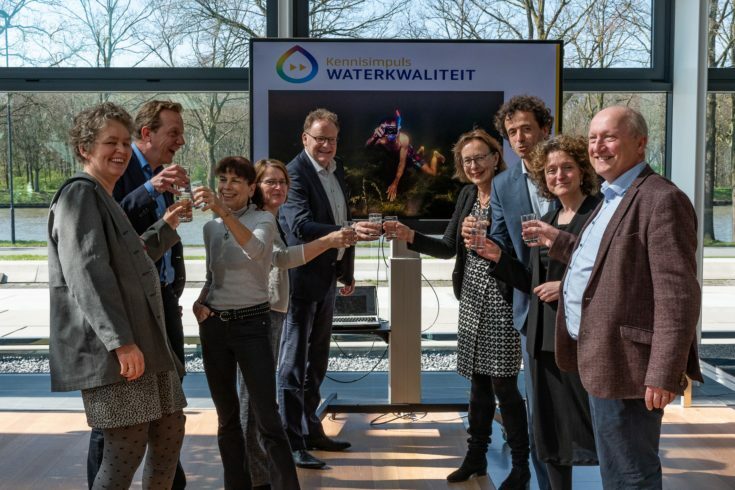 The PBL message was heard and, in November 2016, elicited the declaration of intent ‘Delta approach Water Quality and Freshwater’ (in Dutch) from the government. An important component of this declaration is the reinforcement of the knowledge base. What knowledge do water-quality managers as well as stakeholders (such as agriculturalists) need to actually achieve the Delta-approach ambitions and WFD objectives? This question gave rise to the Water Quality Knowledge Impulse. In this research programme the national government, provinces, Water Authorities, water utilities, and the knowledge institutes Deltares, KWR, WUR and RIVM, will work on gaining more insight into the quality of ground- and surface water and into factors that impact this quality – such as nutrients, plant protection products, pharmaceutical residues and other yet unknown chemical substances. This added insight will enable water managers to take the right measures needed to improve water quality and enhance biodiversity. Through the Water Quality Knowledge Impulse, the minister of Infrastructure and Water Management has responded to demands from the Lower House for a clear knowledge base for water quality. The participants bring together existing and new knowledge, and make this knowledge (more) applicable in practice. The programme’s initial projects got underway in 2018. Starting today, the programme’s progress, and the knowledge it produces over the next four years, can be followed on its website: kennisimpulswaterkwaliteit.nl. The programme’s budget amounts to more than €10 million. The ministry of Infrastructure and Water Management, the Dutch Foundation for Applied Water Research (STOWA), Water Authorities, provinces and water utilities are co-funding the programme.